It’s been a week of big announcements at TBEX – we told you that we’d changed the venue for TBEX Toronto, started selling super-early-bird tickets for TBEX Dublin, and now we’re back to tell you that we have begun adding Toronto accommodation options to the TBEX website. 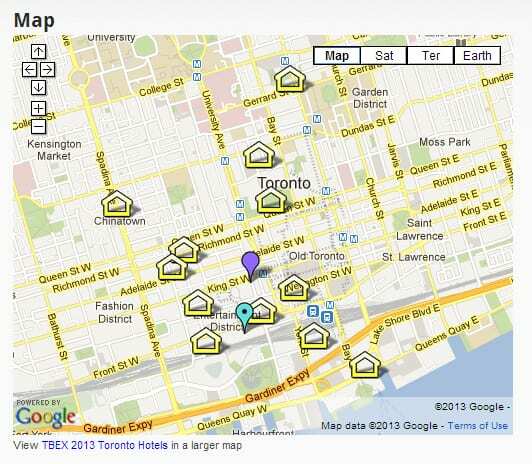 Go to the TBEX Toronto lodging page for the clickable map and list of properties. We’d like to emphasize that we are still going to be adding hotels and other lodging options to this map as we confirm more properties with special TBEX conference rates. So if you don’t yet see something that works for you, please check back to see what’s new. We’ll let you know when the list is complete, too. Also note that every property has its own discount code as well as its own booking procedure in order to make the discount work – so please read each one carefully to make sure you get the TBEX conference rate. What hostels would you recommend ? I’m trying to decide between Canadiana Backpackers Inn (nice and close) or The Planet Traveler’s Hostel. Planet Traveler is one of the best hostels I’ve been to but it’s a bit further from the conference location. Canadiana is not as nice as PT but it’s much closer to the conference and within walking distance. I’d say book Canadiana for during the conference and PT for before or after the conference. Also Canadiana is right around the corner from Khao San Road, some of the best Thai food in the city. Here’s my local’s take on accommodations. My blog also focuses on Toronto-centric activities and life here so feel free to write me if you have any further questions. Note: it has not been updated to reflect the venue change but will be soon. Thank you so much for the reply Natalie, your plan sounds like a good one. I appreciate it and staying close will be nice when switching over from day to night time activities. Planet Traveler is the best hostel here but Canadiana is closer to the Metro Convention Centre.